The Nationals were heavy NL East favorites, but perhaps by default. They’ve won the division the last two years, and in four of the last six, and the young Braves and Phillies weren’t supposed to be this good, this quickly. But never mind the standings, where Washington is seven games back—the Nats are struggling all on their own. After a 3-0 home loss to Boston to cap off a sweep, Nationals are 42-43, which marks the latest in a season they have been below .500 since 2015. Following the game, the Nationals’ veterans called a players-only meeting in the clubhouse, and from the version reporters were given, Max Scherzer appears to have spoken up, loudly. “I think anytime Max holds the meeting or holds court, there’s going to be some yelling,” Adam Eaton said. It was another rough loss, an 11 a.m. start on a hot, hot day, and the Nats scraped out zero runs and just three hits against Boston starter Eduardo Rodriguez—who’d gotten shelled in his last two starts—with the 3–7 hitters going hitless. Boston’s runs weren’t exactly bangers; the Red Sox first got on the scoreboard in the seventh with a sac fly that Eaton might’ve let drop, and threw off-line trying to nail Rafael Devers at the plate. The second run scored two batters later on a Ryan Madson wild pitch. “We were a pretty good team in May. Not very good in June,” Nats Manager Dave Martinez said of the team’s struggles, “but we’ll get better.” It’s July now, has been for a while, and things haven’t really gotten better, but his point mostly stands. Washington has now lost five in a row, and 18 of its last 24, which is MLB’s third worst record over that span, bettering only the woeful Orioles and Royals. The Nationals have been shut out eight times since the start of June. We’re more than halfway through the season, and if the Nats are going to chase down Atlanta or one of the wild cards, the clock’s starting to tick. The good news is that Washington plays its next 11 games, and 21 of its next 27, against teams below .500. There’s a subplot to all this, which I assure you no one on or around the Nationals has forgotten about: Bryce Harper is a free agent this year, and Bryce Harper is slumping. Slumping by his own gaudy standards, of course—he’s still got 21 home runs and is leading the league in walks—but he is hitting just .215. 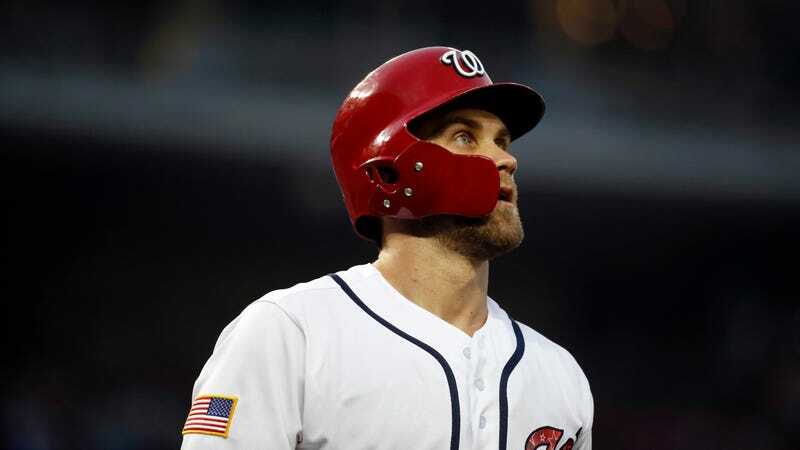 Harper has recently signaled a willingness to play first base, which might be mostly a signal to free-agency suitors, as Dave Martinez says he can’t imagine starting Harper there. That’s worrying. So is the fact that the Nats, who have been able to offer Harper regular playoff appearances, might not do so in his walk year. There is lots of time left, and two relatively inexperienced teams in the way. But Harper and the Nationals are still on the wrong side of the standings, and it’s a hell of a lot easier to not be caught than it is to catch.